John Stevens Shop, “John Stevens Shop,” Histories of the National Mall, accessed April 23, 2019, http://mallhistory.org/items/show/507. The John Stevens Shop is a stone carving workshop based in Rhode Island and currently co-owned by the father and son team of John E. and Nicholas Benson. They have been involved in the design and execution of lettering for inscriptions for four memorials on the Mall. 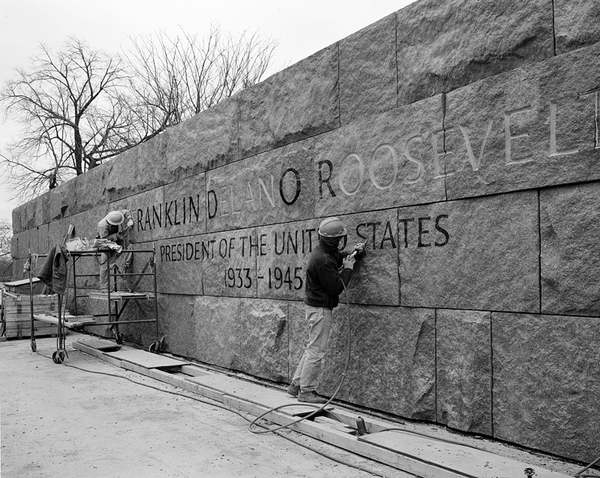 The Bensons designed and executed special typefaces, or lettering styles, for the Franklin Delano Roosevelt Memorial, the World War II Memorial, and the Martin Luther King Memorial. Additionally, John Benson designed the lettering for the date stones in the Vietnam Veterans' Memorial. The Shop was founded in 1705 by John Stevens, an immigrant from Oxfordshire, England. Stevens and his descendants, who owned the shop in Rhode Island, carved gravestones in cemeteries across the state. John Howard Benson bought the shop from the Stevens family in 1927. The Bensons continued to carve gravestones, while John H. Benson also designed and carved inscriptions for university and other institutional buildings. He designed the inscription on the Iwo Jima Memorial in Arlington National Cemetery. After John H' death in 1956, ownership passed to his son, John E Benson. John E designed and carved inscriptions on public and private buildings, national memorials, and the headstones of prominent Americans. In addition to working as a stone carver, he was also a calligrapher and sculptor. In 1993, he retired, maintaining co-ownership of the Shop, but leaving the creative direction to his son Nicholas. Nicholas Benson studied type design and calligraphy in Basel, Switzerland with European masters. In 2007, he was granted a National Heritage Fellowship by the National Endowment for the Arts, and in 2010 he was a awarded a prestigious MacArthur Fellowship.